Dan Lepard had a great recipe in The Guardian magazine back on 19 September 2009. I don't recall anyone here posting about it, but when I tried it I encountered a problem. Nothing insurmountable, though, thanks to Dan's forum. Anyway, I wrote about it in detail at my blog. I'm putting this here in case anyone else comes looking. And here's the warning: be very careful not to overheat the initial mixture of rye and coffee. I've noticed several (well at least two - this one and another 100% rye) of your rye recipes involve boiling some percentage of the rye flour. Could you explain why this is done? I understand it is a traditional technique used for making rye bread. However it's not clear what theory lies behind its use. In the past, I've made the assumption that boiled rye (gelatinized starch) allows more rapid/complete sacchirification of the rye starches to give a sweeter end product. This poses a problem in my mind - since most of the 'structure' of rye bread hinges on long chain sugars (Pentosans in the case of rye?) rather than gluten which is minimal..would the process of boiling and hence easier starch hydrolysis also making the bread more susceptible to collapse during fermentation and/or baking? Is there some part of the puzzle I'm missing here, or is my basic assumption incorrect? Your thoughts and knowledge on this subject would be much appreciated. As noted above, do NOT boil the rye and coffee mixture. Or rather, if you do be aware that you will definitely have to add quite a bit more water to the recipe to get a nice soft dough. This loaf looks very interesting to me. I am wondering if you are making a point of not establishing tension on the outer surface of the dough as you roll it up? Are you not interested in establishing the gluten cloak? Coffee is one of those things that you hope tastes as good as it smells. I'm thinking the aroma and flavor of this bread could be varied quite widely, depending on what coffee was used and how fresh it is after brewing. Have you played with this aspect on this bread? I found your blog site very helpful. Thank you for such a wonderful looking recipe. I plan to try it today. I have reading your discussion about the scalding. It sounds like bringing it to a boil is definitely not a good idea. I made this loaf and posted it in another thread, not wanting to HJ this one. Jeremy, thanks for posting this bread and a nice write up that took me to Dan's Blog site. This is a special bread and a unique combination of flavors. We really enjoyed it. I had a couple good things happen with this bread...mistakes I will repeat intentionally. I misread the recipe and put the all the rye flour into the coffee, which made it too stiff to really "boil", so I stirred it continually and watched for the texture to change. It went from a raw paste to a cooked "gelled" semi-transluscence, and I declared it finished and moved on to cooling the rye. The dough seemed dry as I was mixing (it didn't quite take all the wheat flour) but as it rested and was kneaded it became sticky, but worked up well with the lightly oiled surface. This recipe makes a wonderful Party Rye (aka Cocktail Rye), when baked as two long, skinny loaves, and sliced thin. The texture is perfect (a little bouncy, very tight crumb with a thin, crisp crust) and the flavor asserts itself harmoniously with bold cheeses and spreads. 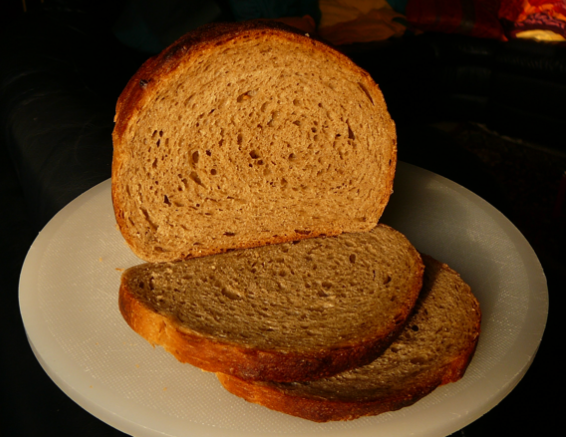 Another thing I'll try soon is to slice and "twice bake" these skinny loaves, for a zwieback type snack bread. Thanks so much for sharing this recipe, it's one I'm going to have a lot of fun with. I have been reading The Handmade Loaf the last few days and discovered something worth sharing. Dan mentions in another recipe that uses scalded rye to try adding the rye with the water temp at 100C and again at 80C. He says you will notice the difference. This got me thinking that it would be easier to control how well cooked the rye would be if you don't actually cook it in a pan but rather add the rye to a determined water temp. off the heat, then quickly cool it. I have made this bread 3 times now and the scalding part is a challenge to get right if you start with cold water and rye in a pan. The outcome is more assured using the hot water method. I'm presuming the added available sugars are helping this mix rise so well compared to other rye's I have baked. Dan uses this technique (scalding) in many of his other rye breads in the book. It does seem to significantly change the crumb for the better. But which is recommended? Adding the rye to boiling water (100C) or to water at 80C? I think the idea is to try both and see the difference in the crumb. The recipe calls for 100c. The outcome changes depending how heavy the pan is and how quickly you get the scalded rye into a bowl to cool. I've stumbled onto two things.... I'm on my Austrian electric range now, had gas when I made this last, and found it easier to burn the bottom with electric. I was surprised how quickly the mixture started to "blurp" and so a thin skin was left on the bottom of the pan despite my agitated agressive stirring. (Next time stir constantly while heating.) When the hot flour/spice/coffee mixture had lost it's cloudiness, I poured it over into a bowl but scraped the thin thick coating stuck on the pan bottom into the dough, it never did incorporate very well, so if it happens, just forget it ... easier than picking out the dark gooey lumps in the dough. My dough seemed very dry, dryer than before so I ended up adding 50g extra water. Probably the white flour, using type 700 wheat now with type 960 rye. The second thing.... I couldn't find any mixture of "breadspices" and added a teaspoon of crushed coriander, 1/2 t. powdered caraway, and looked like crazy for anise or fennel. I checked the booze cabinet for some such flavored liquor ....to no avail. I added a little 5 spice Chinese mixture (really 9 spices) and the bread has a very light gingerbread taste and aroma. Second day the pepper taste becomes more dominant but it is still there. We're making ham & cheese sandwiches. My son thinks it is too much like gingerbread and has visions of non-sandwiches dancing in his head. I had another go at the black pepper rye yesterday myself, with some changes (blogged about here.) I didn't boil the rye in the coffee this time, just poured boiling coffee onto the rye. That worked well for me. And I used 100 gm of my white starter at 100% hydration instead of yeast. The only problem was that I might have baked too soon, not leaving enough time for the final proving. At least, that how I interpret the explosion along the side of the loaf you can see in the photo. But I absolutely had to bake it when I did, and this morning it tasted very good indeed. Nasturtiums seed pods in Lepard's pepper rye? Dan, what do you think of the idea and how many fresh plump pods (grams) do you think it might take?